Intimidation Clothing is pleased to announce the continued sponsorship of middleweight Billy “Mojo” Horne at Absolute Action MMA 37 on January 11th in Florence, Kentucky. A veteran of the M-1 Global and Bellator MMA promotions, Horne (12-4) will look to pickup his 7th win in 9 fights when he takes on UFC veteran Sean Salmon (18-20) in one of the night’s featured pro bouts. Intimidation Clothing is pleased to announce the continued sponsorship of middleweight Billy “Mojo” Horne at Absolute Action MMA 35 on October 19th in Williamstown, Kentucky. A veteran of the M-1 Global and Bellator MMA promotions, Horne (11-4) will look to pickup his 6th win in 8 fights when he takes on Kelly Pennington (2-2) in the night’s main event. Billy “Mojo” Horne, a pro since 2007, completed a 7-1 amateur career before starting his pro career with six straight wins. Now 11-4 as a pro with wins over WEC and Bellator MMA veterans in recent fights, Mojo looks to build on the biggest win of his career, as he dominated Trey Houston in his last outing at Bellator 78 in Dayton just under a year ago. Horne will walk out with a head to toe Intimidation sponsorship, including Intimidation’s premium quality MMA fight shorts, and is one of the most popular MMA fighters in the Cincinnati/Northern Kentucky region. Intimidation Clothing is a fast-growing brand of lifestyle apparel & MMA training gear with a growing national presence and over 50 authorized dealers across the USA. The Intimidation brand is regularly featured on multiple sporting events on SpikeTV, AXS TV, SportsTime Ohio, MTV2, FUEL TV, The Comcast Network, Comcast SportsNet and EpixHD as well as MMA highlight shows on Spike TV, AXS TV and more. In addition to over 110 styles of high-quality, bold t-shirts and sweatshirts for men, women and children the brand is well known for their popular Vintage Series, Local MMA tees and Intimidate Cancer lines of merchandise. 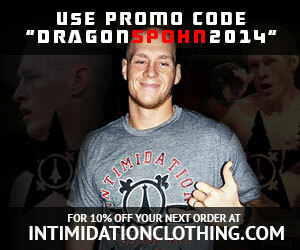 Anyone interested can become a dealer by applying to sell the Intimidation brand which is also available for sale online at IntimidationClothing.com. Fans can also follow the marketing wing of the Intimidation brand, Intimidation Interactive Media, @IntimidationIM, like Intimidation Clothing on Facebook or follow @IntimidationMMA on Twitter. Intimidation Clothing is pleased to announce the sponsorship of Ohio based flyweight/bantamweight Carson Gainey for his upcoming fight in St. Louis. Gainey, a pro since late 2008, will step inside the cage as a pro for the 24th time, as he is set to compete at the Intimidation sponsored MMA Sport Federation event in St. Louis, Missouri. Gainey (9-14) will compete for the third time in 2013 as he looks to snap a 2-fight losing streak. Most recently, he was submitted by Justin King in the second round of a bout at the Midwest Fight Series event in Indiana in May. A former Ohio University wrestler, Gainey originally hails from Youngstown, Ohio and has been a longtime member of Team Intimidation. In addition to sponsoring the Gainey, Intimidation will also serve as a sponsor for the MMA Sport Federation event as well as rising lightweight fighter Eric Irvin, who competes in the night’s co-main event. Intimidation Clothing is a fast-growing brand of MMA apparel & training gear with a growing national presence and over 50 authorized dealers across the USA. The Intimidation brand is regularly featured on multiple sporting events on SpikeTV, AXS TV, SportsTime Ohio, MTV2, FUEL TV, The Comcast Network, Comcast SportsNet and EpixHD as well as MMA highlight shows on Spike TV, AXS TV and more. In addition to over 110 styles of high-quality, bold t-shirts and sweatshirts for men, women and children and is also known for their premium-quality EliteFighter MMA board shorts. Anyone interested in becoming a dealer can apply to sell the Intimidation brand as a dealer and they can be found for sale online at IntimidationClothing.com. Fans can also follow the marketing wing of the Intimidation brand, Intimidation Interactive Media, @IntimidationIM, like Intimidation Clothing on Facebook or follow @IntimidationMMA on Twitter.